Is there anything nicer than getting a package full of surprises in the mail? How about a package full of surprises in the mail once a month! I’ve noticed a growing number of monthly subscription-box services popping up lately; I decided to check out a bunch of them and report my findings here. Previously reviewed: Knoshbox. La Bella Box curates an assortment of items from boutiques across the country. These may include artisan foods, handmade crafts, or health and beauty items. It’s an appealing concept: the chance to sample carefully selected items from Etsy shops and other makers, and at a quite reasonable price. 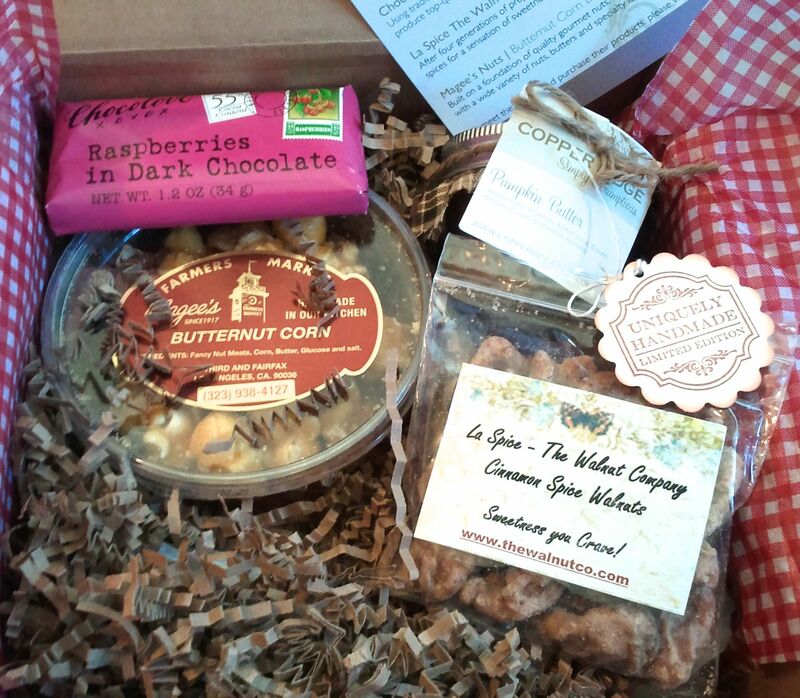 The mix of edible and artsy items sets this subscription apart from the crowd. Sample contents: The September La Bella Box contained handmade caramels by the Bubble Gum Art Co., some very cool Pure Raw Honey Tea from Honey Tea Thyme (you stir a spoonful into a mug hot water for an unusual and heartening drink), a reversible cloth beverage wrap by Joe Jacket, and some cold process honey soap from the Wild Herb Soap Co. The October box — well, this one, comprised totally of food items, made us swoon. Copper Ridge Simply Scrumptious Pumpkin Butter (a big hit with my kids), Chocolove Mini Chocolate Bar (I hogged it myself), La Spice The Walnut Company Cinnamon Spice Walnuts (my husband would like to order these in bulk), Magee’s Nuts Butternut Corn (think Cracker Jack, but eighty-seven thousand times tastier). Gift subscriptions available? Yes, including an email-notification option if you don’t have your gift recipient’s address on hand. At $20, this is an excellent gift idea.